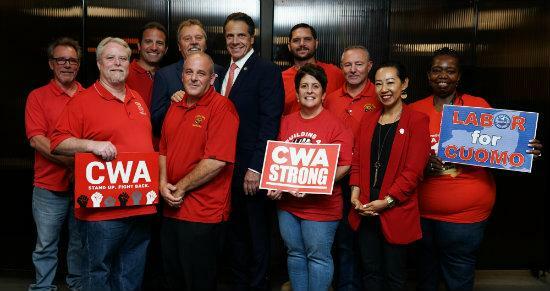 Governor Andrew Cuomo has been there for us time and again over the years, from the Momentive Strike to advocating for Safe Staffing levels for healthcare workers, to standing with us in the fight for high quality telecom service. His victory, along with that of Lt. Governor Kathy Hochul and Tish James running for Attorney General, is a big win for New York’s working people. We were proud to be among the first unions (and, in some cases, the only union) to endorse several of our State Senate candidates - and we made our commitment to getting out the vote known throughout the last several weeks. CWA members knocked on hundreds of doors, made thousands of phonecalls, attended rallies, spoke at candidate events. We were out in the heat, out in the rain, out in the wee hours of the morning and working hard late into the evening right up until the polls closed on Thursday. Every one of our State Senate candidates came away with a victory. The State Senate wins represent a huge shift in New York State politics. Several longtime incumbents who have betrayed New York’s working people again and again lost their seats to fresh faces who are committed to fighting for us. Although we also had a couple of disappointing losses on Thursday in State Assembly races, the overall takeaway from the Primaries is that when we fight, we win! Next up: the General Election this November.